If you are a dairy farmer, at some point you have probably had to endure long months of feeding haylage that your production records suggest was less than inspiring to your cows. Each time this happens, we are reminded that haylage with lousy forage quality is a very costly investment. Granted, New England can be a very difficult place to consistently harvest high quality haylage: variable spring weather, long rainy spells, challenging soils, many small fields scattered around the countryside, etc. That being the case, the difference between high-quality and low-quality haylage is worth pursuing, given that the only way to compensate for poor quality haylage is with purchased feed (mainly grain), which is not cheap right now, and probably will not be in the near future. But can we really PURSUE high quality haylage? Isn’t it just one of those things that happens mostly by chance? It is obvious that farmers cannot control the weather, but there are many things that we can influence. The first thing we can control is our target for being half done with harvest. To optimize milk production from forage, the target should be to be half finished with harvest by the time the forage reaches peak quality. For alfalfa, this means being half done by the time it is at 39% NDF, and for grasses this means being half done by the time it reaches 50% NDF (i.e., by very early boot stage or slightly earlier). It is also important to remember that the difference between high- and low-quality haylage involves more than just the plant growth stage and whether it was rained on prior to harvest. 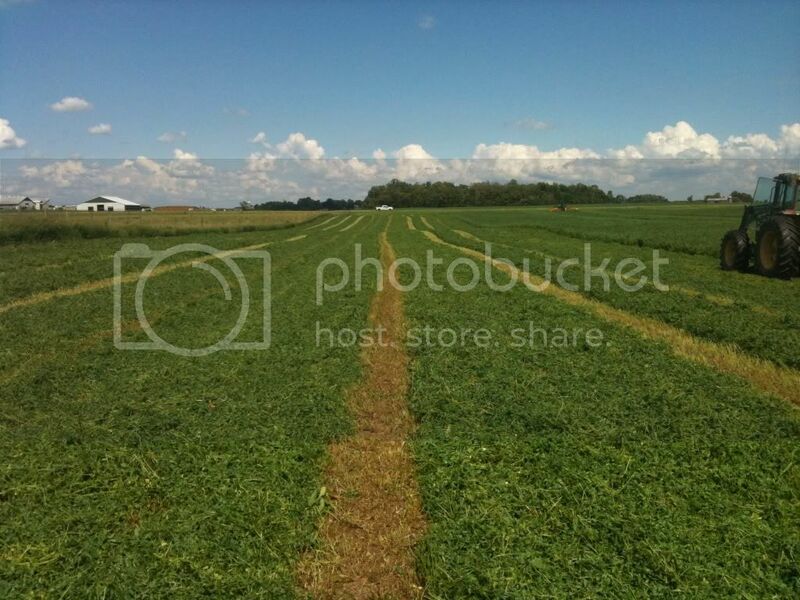 Forage that is cut/wilted and ensiled on the same day will almost always have significantly higher quality than forage that is cut one day and ensiled one or two days later. That being the case, once ensiled the two different products may look almost exactly the same, but the amount of ‘milk per ton’ will not be the same. How much of a difference can it make? Documents from and conversations with Tom Kilcer, retired Cornell University Extension Educator, are the sources for much of the information I am passing along here. Tom’s research shows that leaving the swath in the field overnight vs. cutting and chopping on the same day can reduce the potential milk per ton of haylage ( on a dry matter basis) by 300 pounds. Why is it that these two different materials will feed so differently? To understand the difference, we must review what actually happens when forages are mowed. The act of cutting forage plants off near ground level does not instantaneously kill the plant. Cellular activities in the plant tissue can continue for quite a long time. In the dark of night or in the dark interior of a narrow windrow, plant tissue is a net USER of energy. Plant tissue cannot capture light energy when there is none to be had, yet the ‘cellular machinery’ still needs to be maintained, and this takes energy, which means that existing sugars and starches will be partly or mostly consumed, depending on how long the process continues. Each minute this process continues, your grain bill goes up. How can we get the plant to stop those processes that consume so much of the sugars and starches? Dry it down to harvest moisture and get it packed in the silo – AS FAST AS POSSIBLE! How dry does the plant need to be before the cellular activities stop? The numbers I have seen vary too much for me to have confidence in them; for practical purposes, the principle of ‘dry it down fast’ is what matters most, not a magical number at which the plant is technically dead. the cutting width is not nearly as exposed to sunlight as a wide windrow that is 80-95% of the cutting width. The narrow windrow will also be denser than a wide windrow (assuming the same cutting width) which prevents the warm air during the daytime from penetrating the windrow as quickly. Air will not move through a dense windrow as readily, and the humidity in the center willtherefore generally be higher. en), burning off even more starches and sugars. Not to worry, though, because whatever starches and sugars that are lost in this process can be replaced with purchased grain…. The wide windrow, on the other hand not only dries faster, but early in the drying process while the cells are alive, it can actually continue capturing sunlight for a while. This allows the levels of non-structural carbohydrates (i.e., starches and sugars) to maintain levels similar to or even higher than freshly mowed forage. That means that the net energy for lactation (NEL) of the forage in a wide windrow can actually go UP after it is cut! If you have a New Holland mower, ask your dealer about a ‘wide thin fin’ kit. These fins mount on the swath board of some of their mowers and angle the flying forage outward as it hits the swath board, resulting in a wider swath. The kits cost about $200 and seem fairly simple to install. Buy a new mower that either does or can be adjusted to deliver a swath that is 75%+ of the cutting width. While the old-style sicklebar mowers will obviously lay it down right at cutting width, there are quite a few disc mowers that will also do it just as wide and do so much faster. What about conditioning? One counter-intuitive fact is that conditioning is not helpful if you are only trying to get the forage dry enough to put in your bunker silo; in fact, it can be counterproductive. To understand why, consider that forages have three phases of drying. Assuming the stems of the plant have not been crushed via conditioning, the first phase of drying is driven by the fact that the leaves are still alive. The pores on the leaf surface are open (trying to bring in more carbon dioxide for photosynthesis); at the same time, water vapor is escaping through the pores. Because the plant is no longer connected to the ground, that water is not being replaced in the plant. This allows the plants to wilt down to 65-70% moisture more rapidly than if the forages had been conditioned. The second phase of drying, when the plant moisture is dropping from 70% down to ~35%) happens more quickly if the stems are crushed with a mower equipped with a conditioner. The third phase (below 35%) is more regulated by weather and other factors. If you want a mower that will be useful for dry hay and haylage, it should have a conditioner, but you need not use it when you are mowing wide-swath haylage. One added benefit of not needing to use the conditioner for wide-swath haylage production is that less fuel will be consumed. Is the ‘haylage in a day’ process worthwhile on my farm? Setting up so that you can get haylage in the bunk on the same day it is cut may require some investment in equipment, and it can be more labor-intensive and logistically rigorous. Whether it will be profitable for you depends on whether the improvement in lactation and/or reduction of grain costs outweigh the additional labor and equipment costs. If you are set up to move the crop to the silo on the same day it is cut, you will generally have more harvest intervals (especially for first cut) than you would if you require more than a day to get it done. This can allow the first cut to happen earlier (often resulting in higher forage quality), which can allow an earlier second cut and perhaps more cuttings overall. If your forage quality is almost always as high as it can be and your grain bill is just right, the ‘haylage in a day’ process has very little to offer over what you are currently doing. Finally, higher quality forages will not improve your bottom line as much if you do not account for it when balancing the rest of the ration. Be sure to test regularly and work with your nutritionist to adjust the ration accordingly. By definition, modern ‘high forage’ rations for dairy cattle depend on and account for excellent quality haylage. Any time I present an idea for a solution to a given problem, I understand that there are some for whom the process is simply not practical. You might have cash-flow issues that prevent you from purchasing any new equipment or hiring more labor during busy times. You might have logistical bottlenecks that cannot be overcome without building new infrastructure. Last, but not least, you may have a very influential family member who is not game to try it. If any of the former issues apply, my hope is that some of the principles outlined above will still be helpful as you pursue higher quality forages as a major way of controlling feed costs throughout the year. This article is based on the Haylage in a Day presentation delivered during our 2012 Agronomy Plus winter series. Daniel Hudson is an agronomist for University of Vermont Extension and can be contacted by e-mailing daniel.hudson@uvm.edu or calling 802-751-8307. Kilcer, T. 2006. Wide Swath Haylage to Save Time & Nutrients. Cornell University Extension, Ithaca, NY. Kilcer, T. 2006. You are leaving Money in the field! Same day haylage and 300 lbs. More milk in every ton of dry matter. Cornell University Extension, Ithaca, NY.